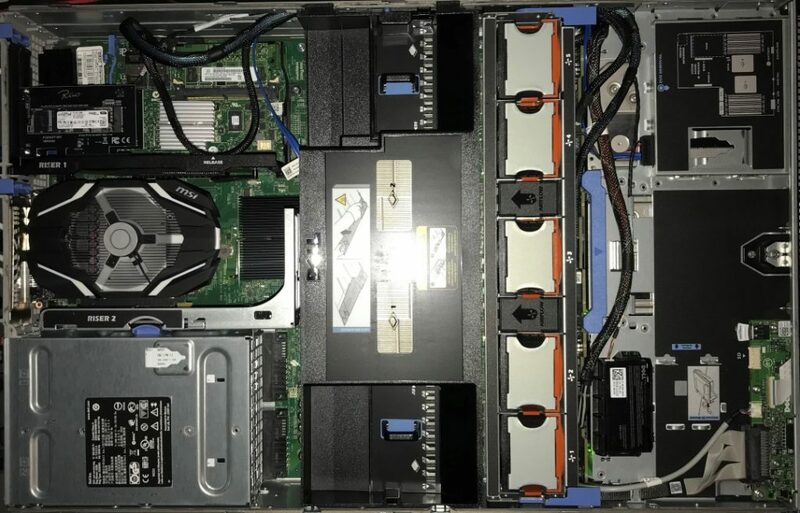 In my last post I I talked about a refurbished rackmount server I picked up to replace my old gaming desktop which was being used as a server for the last few years. 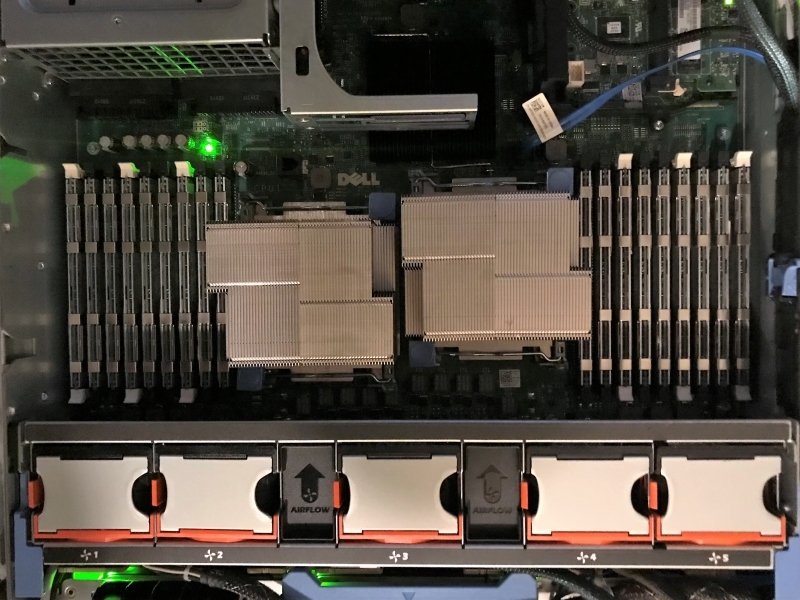 I outgrew my last server, both in hardware and workload, and now it was time to prepare for the next few years starting with hardware. There isn’t much more here to say than what was said in my last post, nor much more I can add to this server. The only possible upgrade would be CPU however it wouldn’t make much sense to pay to upgrade the processors in this server. Here are the specs. Like most things, there are trade-offs with each option. I had to balance space, with speed, with fault tolerance. RAID 0 isn’t really an option for me, no tolerance means if one drive dies I lose the entire array. Most of the data stored on this volume is critical data. It’s pictures, documents, music, and all other digital junk I have been collecting over the years. It’s also a location for all the TV I record over-the-air with Plex. So, in short, I need the most space, with some decent read/write speeds, and some fault tolerance. I ended up choose RAID 10. Looking back, RAID 6 would have also been a good option however I (thought) I needed the write performance when recording multiple shows with Plex. It’s also worth mentioning that even though I have some drive redundancy, it isn’t a backup solution. I do use a backup service to back up my critical data. I will go into detail on that in a later post. So that took care of my “slow” data volume – my long term/slow moving/large file store, but what about fast moving, performant storage? SSDs are the obvious choice however I have limited physical space and wiring within the server chassis. I narrowed down my options to 2 parts – Host OS and Guest OS. Since I will be using a Hypervisor, I will need some storage for it (albeit not the fastest) and then fast storage for all of my guest OSes. The host OS I chose was Proxmox, more about this in a future post, however I needed drive space for this. If you recall, my server came with all storage slots taken. There was however this (near) useless optical drive. That’s when I got the idea to replace it. I remembered reading about dummy slots for laptops that would allow you to remove the DVD drive and replace it with a drive carriage that would house a hard drive. So that’s exactly what I did. I picked up this hard drive caddy so I could replace the DVD drive with a solid state. It worked out perfectly. It was as simple as removing a few screws, popping in my hard drive, then sliding it back into the server. Worth nothing that this is a SATA II controller, so I decided to put an older SSD drive here. This is really just housing the operating system, which does limited reads and writes after booting so it was a perfect fit. I toyed with the idea of getting drive caddies for traditional SSD drives that could pull power and I/O from PCIe slots but then decided on something a little different. I stumbled upon these adapters that would allow you to attach an NVMe M.2 drive and use it in a PCIe slot. I figured these would work perfect. This would give me access to fast NVMe drives with out the need for power or cabling, something this server lacks. I picked up 2 of the caddies along with 2 500 GB Crucial NVMe drives. This would allow me to divide up my guest OS workloads between 2 drives to limit I/O on each. Although the jobs are critical that run on these drives, the data is not. I don’t back up any of the data on these drives except for config and a few databases. 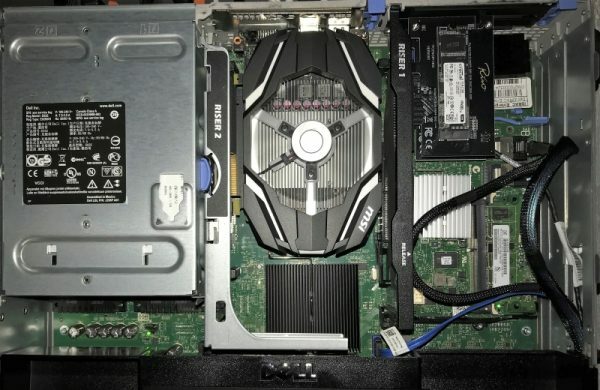 You can see the NVMe drives below in the upper left, connected to the PCIe riser. You can also see the optical drive replacement on the upper right, however you can’t tell there’s a drive inside! If you look closely, you can see that I have a video card tucked in my server. This was one of the biggest challenges for this server and one of the reasons I wanted to upgrade my previous one. Gaming on a server? Not really. Mining Bitcoin? Nope. (I did however learn a ton about building a mining rig through all this!) Running an interactive stream bot that encodes video on-the-fly on Twitch? You guessed it! Without going into detail as to why I have a video card in my server, I had to overcome a fee challenges with getting a video card in here. Regarding the power, I knew that running external power to this card via adapters or splicing server wiring was not going to be an option for me. I didn’t want to run the risk or damaging the server or burning my house down. I am sure people have been able to accomplish this without doing either of the two however this is not something I wanted to pursue. I knew I had to find a video card that didn’t need an additional power pin. Power draw was also going to be an issue however I assumed that most cards that didn’t need power from one of the power pins weren’t going to draw more than 25w on boot. This was an assumption and I had to roll this dice on this one. My next challenge was the PCIe slot. Dell sells a 16x riser however they are crazy expensive and only turn up every so often on eBay. I didn’t want to sink more money into this server for a part that can’t be used in the future. Also, my GPU load didn’t require the full 16x bus. I could get by on 8x, which I did on my last server – so I sought out modifying the riser card. These are cheap to replace and a 16x card can run at 8x. I ended up taking a Dremel and grinding down the end of the 8x slot. I took it slow and ground the back of the slot off so that the card could still be seated. It’s difficult to explain but if you grind perpendicular to the slot (not intuitive) you can slowly remove enough plastic without damaging the board or pins. After I removed enough plastic I was able to seat the card in the slot with the other half (8x) hanging out. So which card did I go with? I ended up choosing an MSI Nvidia GTX1050 2G OC and it worked out perfectly! Overall I am very satisfied with the hardware build. I am able to get lots of processing power and RAM, lots of slow storage, and lots of fast storage too. Adding a GPU was icing on the cake (although a requirement for my application). This hardware build is setting me up perfectly for a Hypervisor OS that can run all of my workloads, including video encoding, all in one system. How about you? Have you ever modded the hardware in your PC/server? Ever run into a problem where you had to apply a “creative” solution? Hello! My name is Timothy Stewart and I live in Minneapolis, MN. I am a software engineer and frequently post about code, infrastructure, and building systems. I also develop applications for iOS, Android, Windows Phone , and Windows Desktop. I'm part of a number of social networks and other websites including: Twitter, LinkedIn, Facebook, Pinterest, Google+ and Foursquare. I'm usually listening to music on my Spotify playlist Coding Programming Hacking Slashing.